All tattoos that are competing must be INITIATED and COMPLETED at the 7th Rijeka Tattoo Expo. Only one tattoo per category per day. For all realistic categorys the participant has to have the original photo on which the tattoo was based. 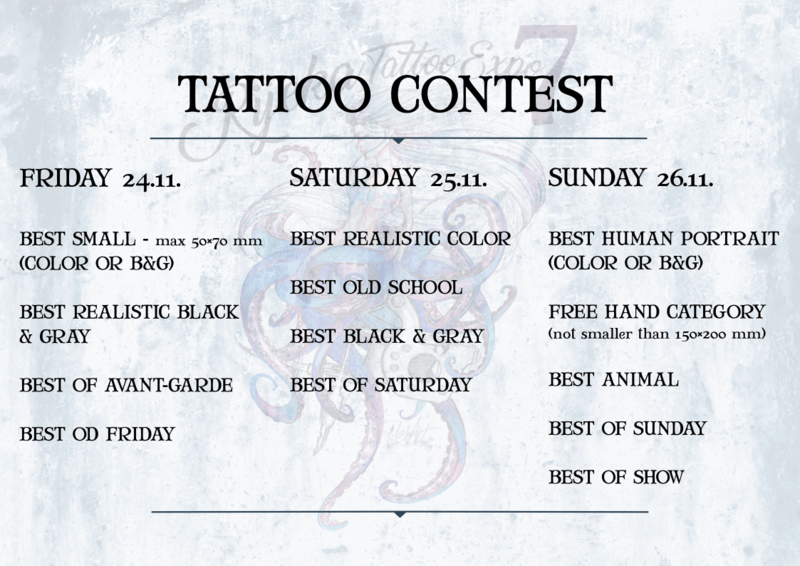 Best of Day (Friday, Saturday, Sunday) is category as any other; if for example, apply tattoo in Best of b&g category you can NOT apply same tattoo for the Best of Day. In the category Best of Day (Friday, Saturday and Sunday) are competing winners (1st place) of three categories in that day and tattoos applied only in the category Best of the Day. In category Best of Show will compete winners in all of categories in three days of the 7th Rijeka Tattoo Expo.